​I'm a freelance photographer and videographer. This is my blog where I post what I photograph and the videos I create. I do a lot of sports and action, but also nature photography. During winter time, the beach at Lathari is full of thick ice which moves somewhat up and down with the tide, but you don't see the sea much except for maybe between the cracks in the ice. Now spring has arrived, and there are only occasional bits of ice left the low tide arrives. Here are some pictures from today when Luna and I visited Lathari to explore. I even got her to sit still for a bit, so I could get some portraits of her. She loves to run and swim in all kinds of waters, muddy puddles and the ocean, and I love how she looks when she has been playing, it shows that she's had a good time. Luna and I visit Lathari a lot. It's a local beach area where when the tide is low you can walk for miles of land that is under water when the tide is high. Always fresh smells and things to drag around for Luna, and for me to throw for her. Also she loves the water and doesn't care if it's winter or summer, she runs into it regardless. It's better in the summer, for me, cause then I can hose her off outside, during winter she must go in the shower for that. 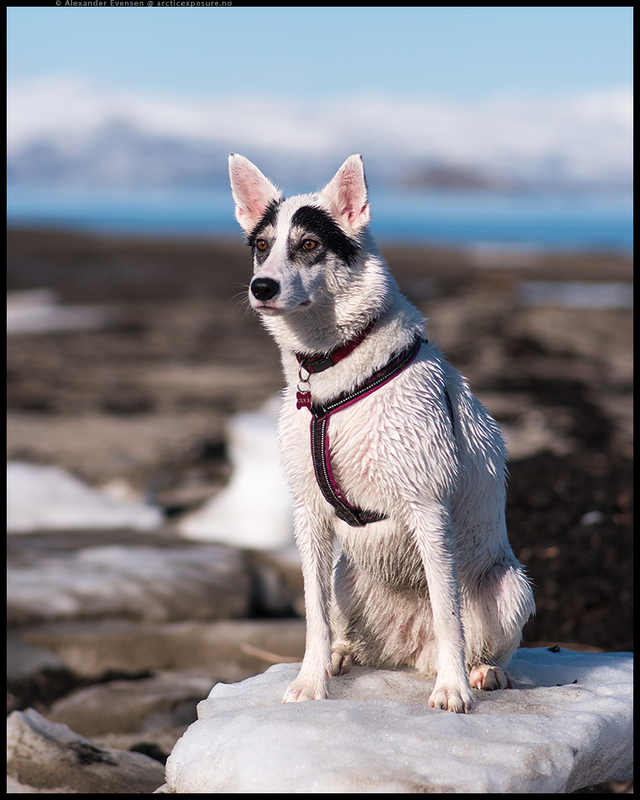 A trip to the snowy Lathari beach in Alta with some friends and all our dogs. Mine is Luna, the very energetic white one with black areas around the eye sand a ring on the back. I just got the Samsung 45mm f/1.8, a small, cheap plastic lens, cause I realizes it would be nice to have something with auto focus for when Finnmarksløpet starts at the end of this week. My impression of it so far after having using for a couple of day is extremely positive. i don't understand how they managed to make something so cheap be so good. It renders sharp images at f/1.8, and that's with 28 megapixels on an APS-C sized sensor. I'm very impressed. A full review is coming later. This is the lens I used for the video, it was my first time using anything with auto focus on the NX1, so I wasn't completely aware of how it worked, but the result was still pretty good in my opinion, these are active dogs, and Luna is a white dog, and it was snow, so quite impressed. This Sunday I also recorded some video of snowmobile drag racing, and I'm working on that now, so that's coming up before Finnmarksløpet starts on Friday, so look out for that.